Mary Ann Cloyd, responsable du Center for Board Governance de PricewaterhouseCoopers (PwC), vient de publier dans le forum du HLS un important document de référence sur le phénomène de l’activisme des actionnaires. Son texte présente une excellente vulgarisation des activités conduites par les parties intéressées : Qui, Quoi, Quand et Comment ? Je vous suggère de lire l’article au complet car il est très bien illustré par l’infographie. Vous trouverez ici un extrait de celui-ci. 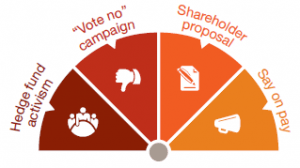 Shareholder Activism: Who, What, When, and How? 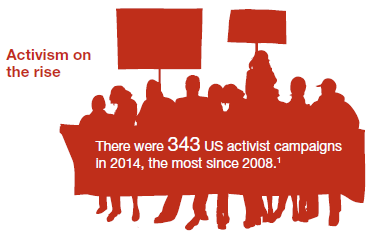 Who are today’s activists and what do they want? “Activism” represents a range of activities by one or more of a publicly traded corporation’s shareholders that are intended to result in some change in the corporation. The activities fall along a spectrum based on the significance of the desired change and the assertiveness of the investors’ activities. On the more aggressive end of the spectrum is hedge fund activism that seeks a significant change to the company’s strategy, financial structure, management, or board. On the other end of the spectrum are one-on-one engagements between shareholders and companies triggered by Dodd-Frank’s “say on pay” advisory vote. The purpose of this post is to provide an overview of activism along this spectrum: who the activists are, what they want, when they are likely to approach a company, the tactics most likely to be used, how different types of activism along the spectrum cumulate, and ways that companies can both prepare for and respond to each type of activism. At the most assertive end of the spectrum is hedge fund activism, when an investor, usually a hedge fund or other investor aligned with a hedge fund, seeks to effect a significant change in the company’s strategy. Some of these activists have been engaged in this type of activity for decades (e.g., Carl Icahn, Nelson Peltz). In the 1980s, these activists frequently sought the breakup of the company—hence their frequent characterization as “corporate raiders.” These activists generally used their own money to obtain a large block of the company’s shares and engage in a proxy contest for control of the board. In the 1990s, new funds entered this market niche (e.g., Ralph Whitworth’s Relational Investors, Robert Monks’ LENS Fund, John Paulson’s Paulson & Co., and Andrew Shapiro’s Lawndale Capital). These new funds raised money from other investors and used minority board representation (i.e., one or two board seats, rather than a board majority) to influence corporate strategy. While a company breakup was still one of the potential changes sought by these activists, many also sought new executive management, operational efficiencies, or financial restructuring. During the past decade, the number of activist hedge funds across the globe has dramatically increased, with total assets under management now exceeding $100 billion. Since 2003 (and through May 2014), 275 new activist hedge funds were launched. Forty-one percent of today’s activist hedge funds focus their activities on North America, and 32% have a focus that spans across global regions. The others focus on specific regions: Asia (15%), Europe (8%), and other regions of the world (4%). The goals of today’s activist hedge funds are broad, including all of those historically sought, as well as changes that fall within the category of “capital allocation strategy” (e.g., return of large amounts of reserved cash to investors through stock buybacks or dividends, revisions to the company’s acquisition strategy). The tactics of these newest activists are also evolving. Many are spending time talking to the company in an effort to negotiate consensus around specific changes intended to unlock value, before pursuing a proxy contest or other more “public” (e.g., media campaign) activities. They may also spend pre-announcement time talking to some of the company’s other shareholders to gauge receptivity to their contemplated changes. Lastly, these activists (along with the companies responding to them) are grappling with the potential impact of high-frequency traders on the identity of the shareholder base that is eligible to vote on proxy matters. Some contend that hedge fund activism improves a company’s stock price (at least in the short term), operational performance, and other measures of share value (including more disciplined capital investments). Others contend that, over the long term, hedge fund activism increases the company’s share price volatility as well as its leverage, without measurable improvements around cash management or R&D spending. When is a company likely to be the target of activism? The company has a low market value relative to book value, but is profitable, generally has a well-regarded brand, and has sound operating cash flows and return on assets. Alternatively, the company’s cash reserves exceed both its own historic norms and those of its peers. This is a risk particularly when the market is unclear about the company’s rationale for the large reserve. For multi- business companies, activists are also alert for one or more of the company’s business lines or sectors that are significantly underperforming in its market. Institutional investors own the vast majority of the company’s outstanding voting stock. The company’s board composition does not meet all of today’s “best practice” expectations. For example, activists know that other investors may be more likely to support their efforts when the board is perceived as being “stale”—that is, the board has had few new directors over the past three to five years, and most of the existing directors have served for very long periods. Companies that have been repeatedly targeted by non-hedge fund activists are also attractive to some hedge funds who are alert to the cumulative impact of shareholder dissatisfaction. How can a company effectively prepare for—and respond to—an activist campaign? Critically evaluate all business lines and market regions. Some activists have reported that when they succeed in getting on a target’s board, one of the first things they notice is that the information the board has been receiving from management is often extremely voluminous and granular, and does not aggregate data in a way that highlights underperforming assets. Companies (and boards) may want to reassess how the data they review is aggregated and presented. Are revenues and costs of each line of business (including R&D costs) and each market region clearly depicted, so that the P&L of each component of the business strategy can be critically assessed? This assessment should be undertaken in consideration of the possible impact on the company’s segment reporting, and in consultation with the company’s management and likely its independent auditor. 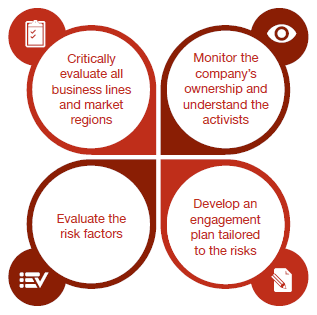 Monitor the company’s ownership and understand the activists. 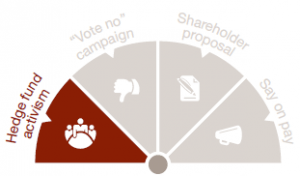 Companies routinely monitor their ownership base for significant shifts, but they may also want to ensure that they know whether activists (of any type) are current shareholders. Understanding what these shareholders may seek (i.e., understanding their “playbook”) will help the company assess its risk of becoming a target. Evaluate the “risk factors.” Knowing in advance how an activist might criticize a company allows a company and its board to consider whether to proactively address one or more of the risk factors, which in turn can strengthen its credibility with the company’s overall shareholder base. If multiple risk factors exist, the company can also reduce its risk by addressing just one or two of the higher risk factors. Even if the company decides not to make any changes based on such an evaluation, going through the deliberative process will help enable company executives and directors to articulate why they believe staying the course is in the best long-term interests of the company and its investors. Develop an engagement plan that is tailored to the company’s shareholders and the issues that the company faces. 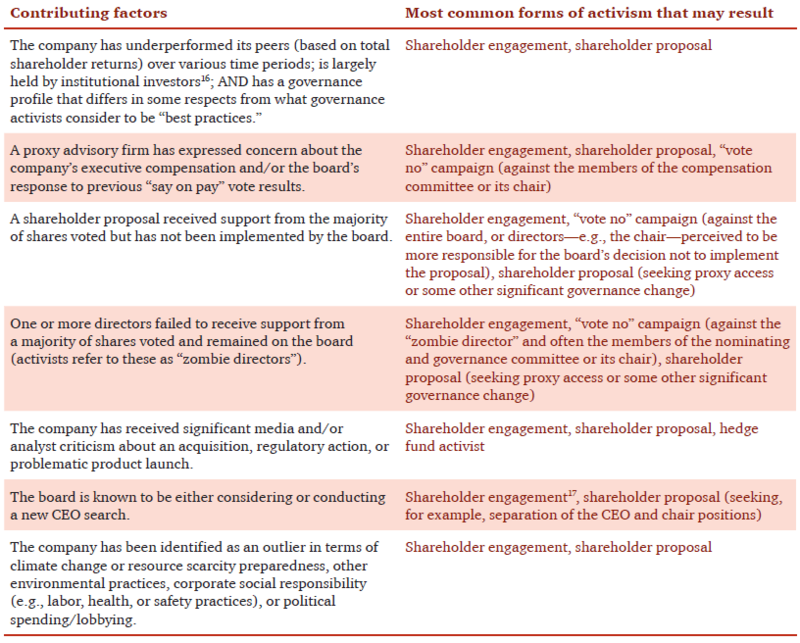 If a company identifies areas that may attract the attention of an activist, developing a plan to engage with its other shareholders around these topics can help prepare for—and in some cases may help to avoid—an activist campaign. This is true even if the company decides not to make any changes. Activists typically expect to engage with both members of management and the board. Accordingly, the engagement plan should prepare for either circumstance. Whether the company decides to make changes or not, explaining to the company’s most significant shareholders why decisions have been made will help these shareholders better understand how directors are fulfilling their oversight responsibilities, strengthening their confidence that directors are acting in investors’ best long-term interests. These communications are often most effective when the company has a history of ongoing engagement with its shareholders. Sometimes, depending on the company’s shareholder profile, the company may opt to defer actual execution of this plan until some future event occurs (e.g., an activist in fact approaches the company, or files a Schedule 13d with the SEC, which effectively announces its intent to seek one or more board seats). Preparing the plan, however, enables the company to act quickly when circumstances warrant. Objectively consider the activist’s ideas. 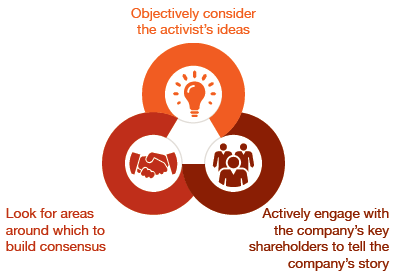 By the time an activist first approaches a company, the activist has usually already (a) developed specific proposals for unlocking value at the company, at least in the short term, and (b) discussed (and sometimes consequently revised) these ideas with a select few of the company’s shareholders. Even if these conversations have not occurred by the time the activist first approaches the company, they are likely to occur soon thereafter. The company’s institutional investors generally spend considerable time objectively evaluating the activist’s suggestion—and most investors expect that the company’s executive management and board will be similarly open- minded and deliberate. Look for areas around which to build consensus. In 2013, 72 of the 90 US board seats won by activists were based on voluntary agreements with the company, rather than via a shareholder vote. This demonstrates that most targeted companies are finding ways to work with activists, avoiding the potentially high costs of proxy contests. Activists are also motivated to reach agreement if possible. If given the option, most activists would prefer to spend as little time as possible to achieve the changes they believe will enhance the value of their investment in the company. While they may continue to own company shares for extensive periods of time, being able to move their attention and energy to their next target helps to boost the returns to their own investors. Actively engage with the company’s key shareholders to tell the company’s story. An activist will likely be engaging with fellow investors, so it’s important that key shareholders also hear from the company’s management and often the board. In the best case, the company already has established a level of credibility with those shareholders upon which new communications can build. If the company does not believe the activist’s proposed changes are in the best long-term interests of the company and its owners, investors will want to know why—and just as importantly, the process the company used to reach this conclusion. If the activist and company are able to reach an agreement, investors will want to hear that the executives and directors embrace the changes as good for the company. Company leaders that are able to demonstrate to investors that they were part of positive changes, rather than simply had changes thrust upon them, enhance investor confidence in their stewardship. When the activism has concluded—the annual meeting is over, changes have been implemented, or the hedge fund has moved its attention to another target—the risk of additional activism doesn’t go away. Depending on how the company has responded to the activism, the significance of any changes, and the perception of the board’s independence and open-mindedness, the company may again be targeted. Incorporating the “Prepare” analysis into the company’s ongoing processes, conducting periodic self-assessments for risk factors, and engaging in a tailored and focused shareholder engagement program can enhance the company’s resiliency, strengthening its long-term relationship with investors.